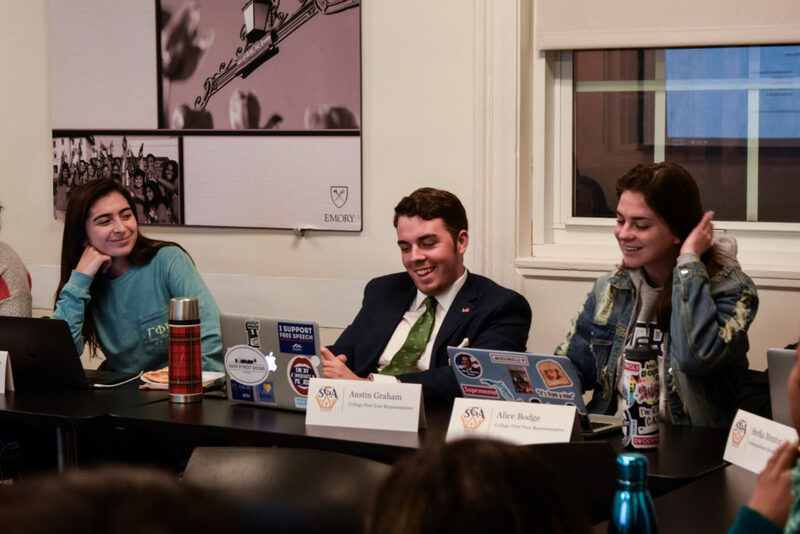 The 51st legislature of Student Government Association (SGA) convened Monday night to debate a bill that would prohibit joint candidacy, hear a proposal to establish the Undergraduate Sexual Health Initiative (USHI) and fund the Soul Food Gospel Fest. The legislators postponed the vote on the SGA Election Code bill to next week, when the legislature will also vote on the USHI bill. Legislators unanimously passed the bill to fund the Soul Food Gospel Fest. Bill 51sl40 would amend the Elections Code to prohibit candidates from running on a party- or joint-ticket and sharing collaborative campaign materials and platforms. SGA President Gurbani Singh (18B) said that having a running mate last year was helpful because she knew that they worked well together. Singh and SGA Executive Vice President Natasha Armstrong (18B) were the first two candidates to campaign together on a party ticket last Spring. “Although we had sort of different initiatives that we wanted to complete during the year, we had the same mission and similar goals and objectives for the year, and I thought that our initiatives were different enough that they would complement each other,” Singh said. Singh admitted that there were issues with the joint ballot last year. But Singh noted that she and Armstrong are considering amending the bill to allow joint candidacy but prohibit joint tickets, which would only allow students to vote for a pair of candidates. Sophomore Representative Johnna Gadomski (20C) said if presidential and vice presidential candidates from different campaigns were elected, there could be tension. Singh responded that candidates would also have to work with candidates from different campaigns even without joint candidacy. Oxford Continuee Representative Mohammad Naveed (17Ox, 19C) said joint candidacy could pose a threat to marginalized students who want to run for SGA president and vice president because they would be running against a pair of candidates who have already served on SGA. Armstrong responded that the mentality that marginalized communities cannot win against a joint ticket because they are “pent up against a more powerful force” is a widespread issue worldwide and on campus. Naveed apologized after the debate to Armstrong and Emory Student Nursing Association (ESNA) Representative Stefka Mentor (18N) for his comment and stressed that he never meant to offend anyone. Mentor mentioned the possibility of allowing all undergraduate students to vote on the issue in a referendum. Attorney General Elias Neibart (20C) said that two-thirds of the legislators would have to vote to send the bill to a referendum. Speaker of the Legislature and Senior Representative William Palmer (18C) opposed a referendum, which would require SGA to collect signatures from 10 percent of the undergraduate student population, according to the SGA Constitution. The referendum could delay the Spring 2018 elections, Palmer added. The Elections Code can be amended with a simple majority vote by legislators and must be approved by the SGA president, according to the Elections Code. Gadomski proposed Bill 51sl42, which would fund $2,930 to USHI. The $2,000 would purchase protective barriers such as male and female condoms and dental dams that would be available to students at all residence halls and the Office of Health Promotion. BBA Junior Representative Jacob Spitzer (19B) praised Gadomski’s initiative, but he noted that the protective barriers provided by the University in the past were low-quality. Voices of Inner Strength (VOIS) President Ivena Santilair (18B) proposed Bill 51sl43 to fund $500 for food, decorations and flyers for the Feb. 18 Soul Food Gospel Fest. The event aims to increase campus awareness for Black History Month and to donate the proceeds to the Atlanta Music Project. Campus musical groups are scheduled to perform, and attendees will be able to eat soul food. The bill was passed unanimously with 12 votes.